Yii is a free, open-source Web application development framework written in PHP5 that promotes clean, DRY design and encourages rapid development. It works to streamline your application development and helps to ensure an extremely efficient, extensible, and maintainable end product. 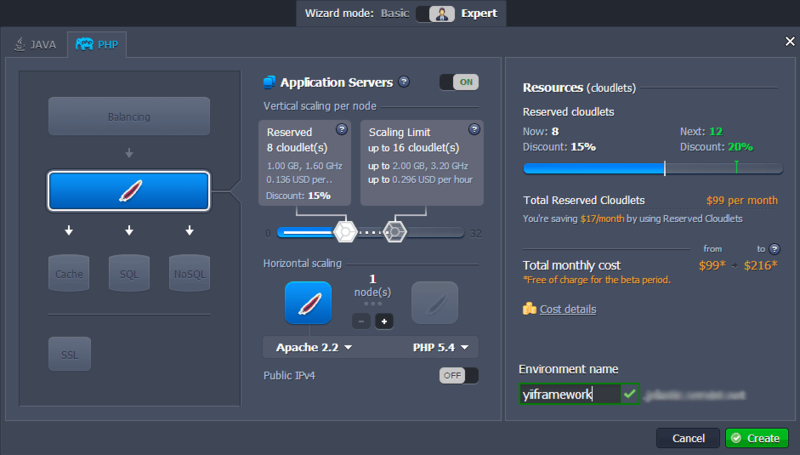 Yii is the fastest PHP framework, best for creating large scale Web2.0 applications. Yii can be used for developing any kind of web applications. It is especially suited for high traffic web applications like portals, forums, social media sites and so on. It comes packaged with tools to help test and debug your application, and has clear and comprehensive documentation. BTW Yii incorporates many ideas and work from other well-known Web programming frameworks and applications. So, let’s see how web development with Yii framework works on Jelastic Platform. 1. Go to Jelastic.com and sign up if you haven’t done it yet or log in with your Jelastic credentials by clicking the Sign In link on the page. 2. While in Jelastic dashboard, click the Create environment button. 3. In the Environment Topology dialog, pick Apache as your application server, specify your cloudlet limits and type your environment name, for example yiiframework. In a minute your environment will be successfully created. 1. We use simple HellloWorld applications, which are included into Yii zip archive. 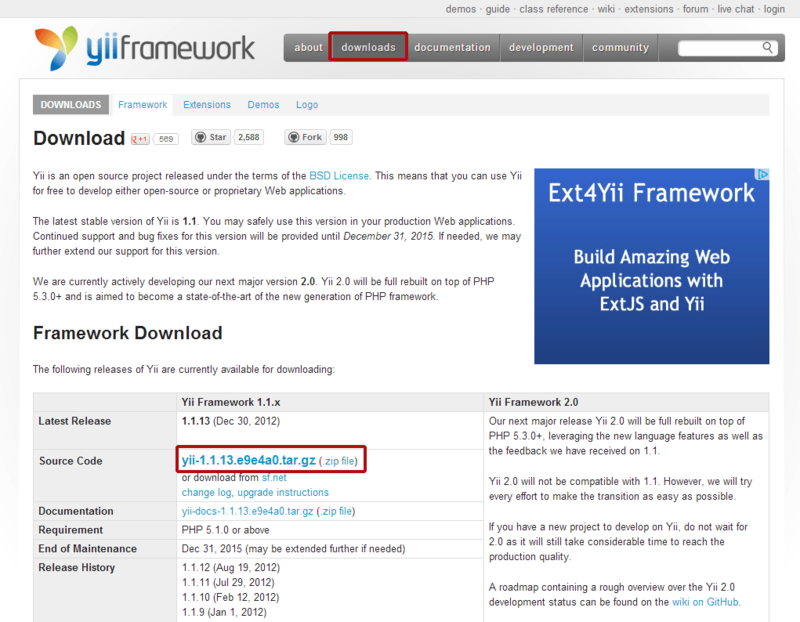 Navigate to Yii web site and download the latest version of the framework. 2. Upload your Yii zip package to the Deployment manager. 3. Deploy your package to the environment you have just created. Now you can open demo applications in a web browser. As you can see demo apps were successfully deployed. It is very easy to edit or customize the Yii based applications, since they have a very simple code structure. YII is purely object oriented, architecturally clean and it is very simple to extend it. Everyone who knows object oriented programming should pick up Yii and try it, at least once.